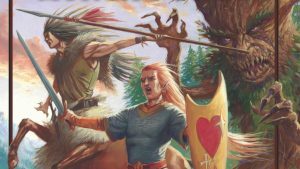 Elf Army Book Kickstarter! – FASA Games, Inc. If you haven’t heard by now, we are happy to let you in on some great news. The Kickstarter for the Demonworld Elf Army Book is now live and already collecting backers. We are very excited to see how far we can take this. At the Kickstarter project page, you can check out the reward levels, stretch goals, read up a little on the Demonworld miniatures game, and kick in a little dough. The Kickstarter campaign runs until June 24th. The current funding goal will cover final art and printing costs. Anything funded beyond that goal will help make Demonworld and Fasa Games Inc. that much more awesome and help produce even more great products down the line. The help of our backers is invaluable in making these books and products a reality. We at Fasa Games are all fans, just like you, and we know how lucky we are to be able to continue this work. With your support, we can keep doing what we love and keep bringing these worlds to life and into your homes and game stores.